Sooner or later, your kid is going to have to use the toilet. However, your will you will need to prepare him for that. There are two options that are available to you, and they are potty chairs or seats. These two kinds of toilet training equipment are different are suited for different circumstances, but serve the same purpose. For travel purposes, it is better to use the compact and foldable ones. Since you would want to buy the best of these toilet trainers, we shall later provide you with a review of some of the best potty chairs and seats. What is the difference between a potty seat and chair? A potty chair is a toilet trainer that can be placed on the floor and used directly by the child to either defecate or urinate. What are the pros and cons of using either a potty seat or a chair? The most useful thing about a toilet chair is that it can be used anywhere. The other advantage is that it is tailor-made for toddlers and hence is more comfortable and is less intimidating as well. However, it has to be cleaned every time and that might not so much a fun thing to do. In contrast, a potty seat is not usually messed up and is usually very portable. Moreover, kids would tend to easily adjust to using the adult toilet if a seat is used in place of a chair. But the major downside is that it can only be used in a toilet. Kids might find the height scary, too. What should you look out for on a potty chair? Some of the things you should look out for in a potty chair include a pull out drawer that lets you get rid of the waste quite easily, and a high back so that your toddler can be very comfortable. It should also come with a toilet paper holder so the kid can have ready access to her own toilet paper. In addition, it is sometimes better to opt for potty seats that have a handle in order to provide stability to the child. For male toddlers, a potty seat with a removable splash guard is often preferred. It is also important to consider buying potty seats that are furnished with an inbuilt footrest. Now that we have pointed out the features to look out for when buying the best potty chairs and seats, we shall proceed to review the best travel potty chairs and seats that make our list of the top five. 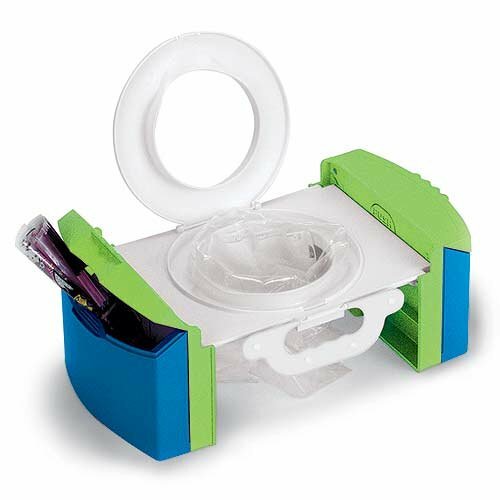 First, this is a very portable and flexible potty seat that can also be fitted with disposable bags and used as a chair. The legs can be completely folded and as such can be stored easily in diaper bags. When it is used in a toilet, the legs can be adjusted to fit tightly to the toilet in order to ensure stability. It is also furnished with non- slip grips and disposable bags that are made of absorbent materials. In addition, it has a splatter shield that makes it perfect for male toddlers. It has a rating of 4.6 on Amazon. Considered one of the best potty chairs and seats, potty seat can is highly compact and can be folded to as small as 18cm by 15 cm by 5cm in size. It can therefore fit perfectly into a travel bag. Most importantly, it can easily be used for toilets of different sizes due to the nature of its design. 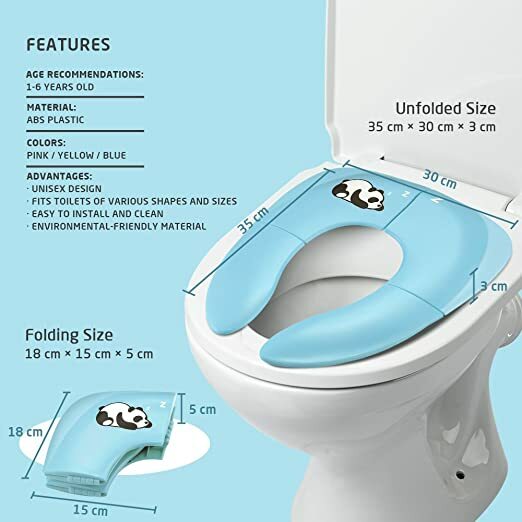 For stability, it is equipped with two non-slip paddings that lock tightly to the toilet and for maximum safety of the kid, it is, made of food grade ABS material that is known to be non-toxic and odorless. It is has a 4.5 rating on Amazon. The cool gear travel potty chair stands at some six feet from the floor and is suited for weights of up to 50 pounds. Like every other travel potty, it is very compact and easy to carry about. It comes with two inbuilt, large storage chambers, as well as a few storage bags. It is also versatile since it can be used with any 1-gallon bag and not necessarily the ones from the manufacturers. It is completely sealed so that it the smell of waste does not escape from inside. This travel potty boasts a user rating of 4.6 and has nearly 400 reviews. 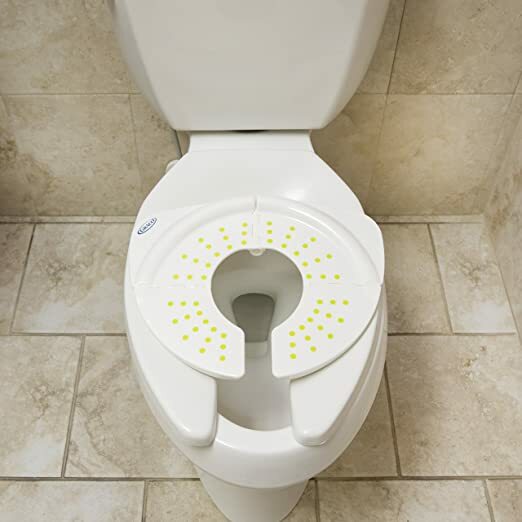 Another popular product that has enjoyed favorable user rating is the Garco travel potty seat. It ranks among the best for a few reasons. The first is that it is made of safe poly propylene material. It has a rubber padding underneath that is supposed to prevent it from slipping. In addition, it can fit into most of the standard and elongated toilets. It comes with a reusable plastic bag and this surely makes it more economical to use. There is also a Lysol spray inside the bag that is used to disinfect the bag after use. Our last product is the superb Kalencom potty chair. Just like the potty chair from OXO that we first reviewed, it can be used as a seat too. The liners are disposable and are made to be leak proof. It can handle weights of up to 50 pounds and is very durable. It is also designed not slip when the child sits on it. The seat is shaped in such a way that the child feels maximum comfort. It enjoys an Amazon rating of 4.5. Only fits standard toilet sizes. The product that we consider most remarkable among our best travel potty chairs and seats is the OXO Tot 2-in-1 Go Potty for Travel. This product, being a dual purpose potty, is surely the perfect choice as it combines the advantages of both potty seats and chairs and is especially ideal for those looking for a touch of versatility. Compared to its closest rival, the Kalencom 2-in-1 Potette Plus, the features are generally the same. 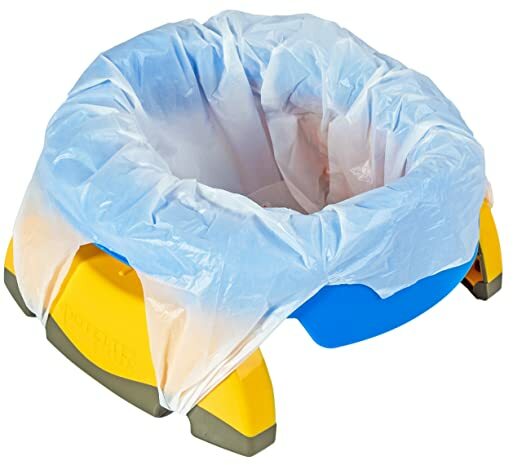 But the splash shield which it has clearly makes it lead other products among the best travel potty chair and seats that we have reviewed.